Entrance to the “Zoological Garden at Uyeno Park”, Tokyo, c. 1910. Established in 1882, Ueno Zoo is the oldest zoo in Japan. The zoo is in Ueno Park, a large urban park that is home to museums, a small amusement park, and other attractions. 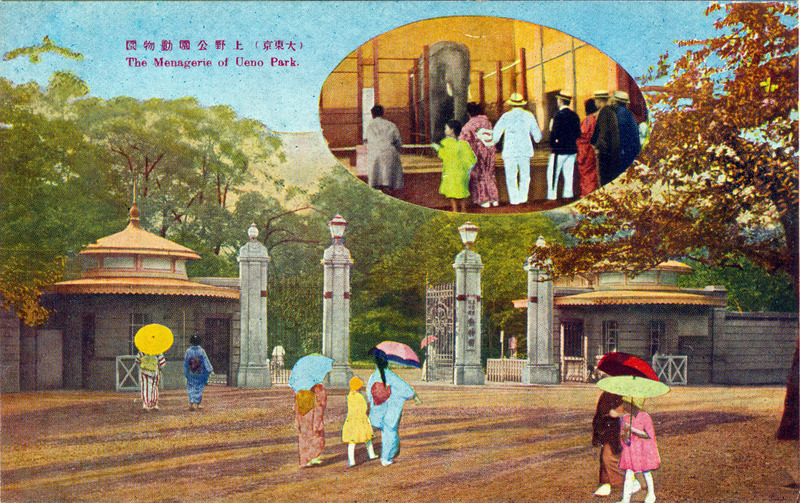 The ground was originally estate of the imperial family, but was bestowed to the municipal government in 1924 — along with Ueno Park — on the occasion of crown prince Hirohito’s wedding. 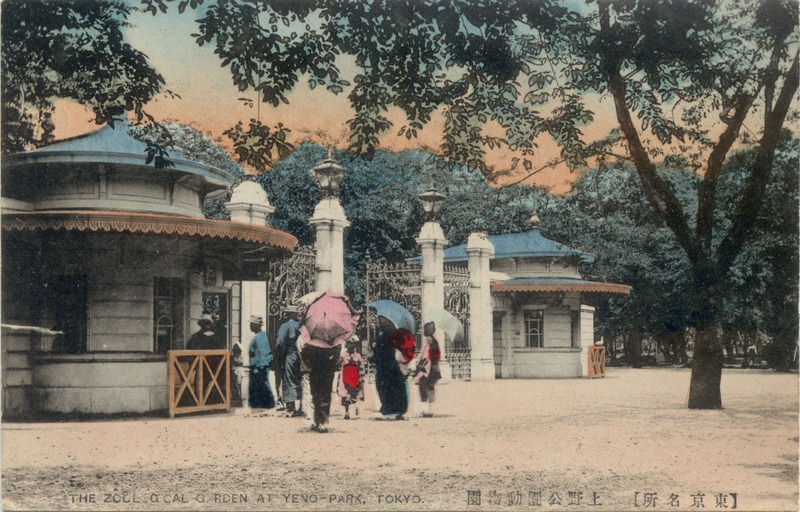 The Ueno Zoological Gardens, Tokyo, c. 1930. “Governor-General Odachi decided to destroy the ferocious animals at Ueno Zoo after much deliberation for a person who was known for his quick decision making. He made the decision carefully because he was concerned with the possible negative reactions to the disposal by citizens, especially by children who enjoyed watching these ferocious animals at Ueno Zoo. 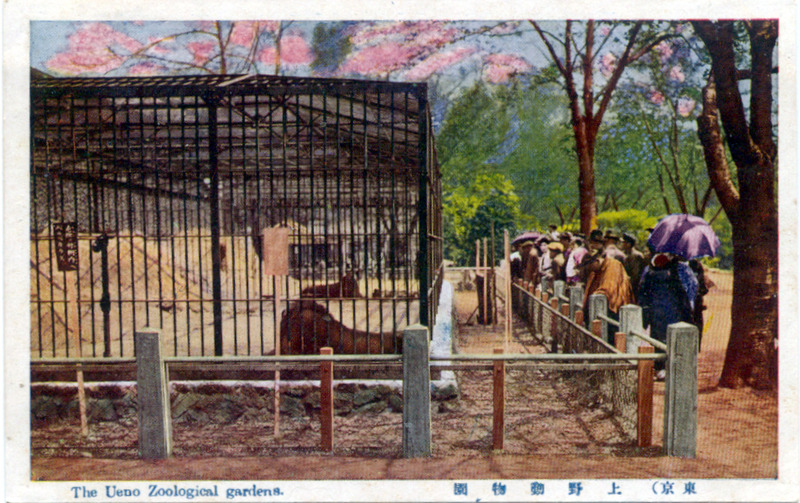 The Menagerie of Ueno Zoo, Tokyo, c. 1930. Between August 17 and September 11, 1943, grieving zoo staff were ordered to kill the more than twenty captive zoo carnivores and herbivores at Ueno Zoo. The zoo’s most beloved residents, three Asian elephants, suffered most of all, finally succumbing after weeks of painful and bewildering starvation. In post-war Tokyo, children wanted an elephant so much that they wrote to Prime Minister Jawaharlal Nehru of India for one. Their wishes were granted, and in 1949 Nehru sent a female elephant to the children of Japan. Named Indira after his daughter, the 15-year old elephant arrived at Ueno Zoo, her permanent residence, on September 25, 1949.